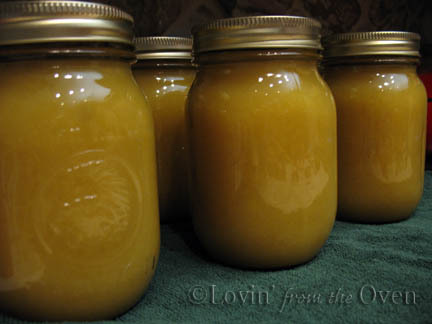 My apples were ready late last November and I made applesauce with my Red Delicious and Golden Delicious apples. First, wash, core and quarter apples. If you don't have a food mill, peel your apples. Put them in a large stockpot with just enough water on the bottom of the pot to prevent sticking. Cook until softened; only a couple of minutes. 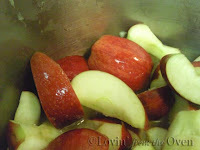 Put steamed apples into a food mill or processor. This food mill is similar to the one pictured here, which separates the skins from the fruit. 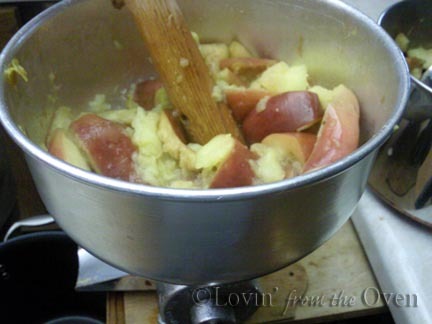 Return apple pulp to a stockpot, and add sugar to taste (1/4 c. per pound). I prefer to bottle my sauce without sugar. During the last five minutes of cooking, you can add cinnamon, nutmeg or allspice. I prefer to keep mine plain. 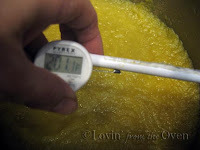 The Blue Ball Book of canning says to bring your applesauce to a boil (212ºF), stirring to prevent sticking. 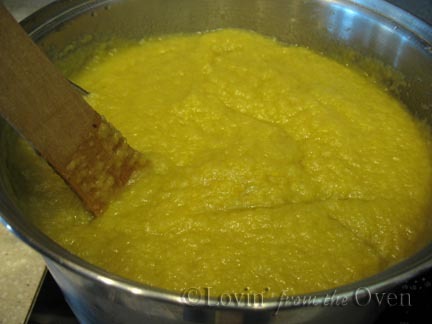 This started bubbling at 160ºF like the lava pots at Yellowstone, giving me three minor burns on my hands while stirring it. I could NOT get it above 201ºF and gave up trying to reach 212ºF. The boiling point of water at 4000-5000 ft is 204F. It will never go higher. The key to hot packing is “hot”. It doesn’t have to be boiling hot. 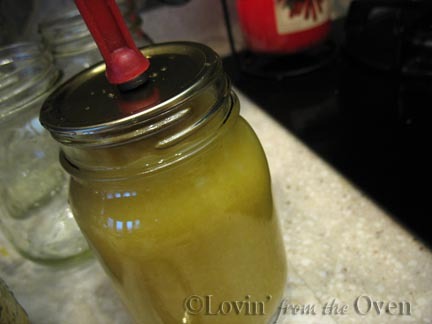 Just heat applesauce until hot. 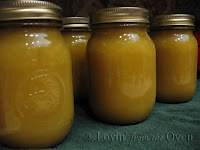 Check out the USDA recipe here: http://www.uga.edu/nchfp/how/can_02/applesauce.html. Note it doesn’t say boiling. Ladle hot sauce into hot jars, leaving 1/2" headspace. Remove air bubbles by sticking a plastic knife into the sauce and running it around. and put a lid and ring on it. 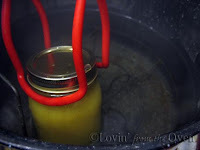 I love this canning wand with a magnet on the end! Screw a ring on finger-tip tight; firm and snug, not superhuman tight! At 1,000-3,000 feet altitude, add 5 min. to this time. 3,000-6,000 feet altitude, add 10 min. 6,000-8,000 feet altitude, add 15 min. 8,000-10,000 feet altitude, add 20 min. 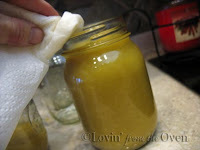 Gently remove processed jars onto a towel covered heat proof surface to cool completely, 12-24 hours. Listen to the jars *ping* as they seal ~ the sounds of success! Great tutorial. I have never made applesauce before. Yum. Frieda - I'm dying over finding out that you posted this today. I just went and picked 60 pounds of Cortland apples and am going to make applesauce and wanted a tried and true canning method. Thank you! Here's my question, though, how much water would you say actually prevents sticking? 1 cup? Or is it more like the apples should be covered in water? Melanie, just enough water in the bottom of the pan, let's say 1/2"...not more. Good luck~ can't wait to hear how your applesauce turns out! Frieda, is there anything you don't do? This looks wonderful! I have always wanted to can but never have. I don't even know where to start. Any suggestions? Jaime and Jen...I would start with borrowing a water bath canner and equipment from a friend. If you can't borrow one, purchase a complete kit from Amazon: http://tinyurl.com/2fanloz for about $65. The included Ball Blue Book will be your Bible to canning. Hey there! I just checked your post after reading your comment on my blog...looks like great minds think alike! ;) Great tips. You're my canning idol. Just wanted you to know.